This is basically what I ate for the entire week this week. Breakfast: I switch between keto pancakes and scrambled eggs with sour cream and cheese for breakfast. Morning Snack: I almost always start getting hungry around 10 am so I have 3 pieces of string cheese. Afternoon Snack: Today I wasn’t really hungry for a snack. If I am hungry I have a 1/2 avocado. Dinner: For dinner I try to get a different meat group – Monday is chicken, Tuesday is Mexican, Wednesday is pork, Thursday is chicken again, Friday is seafood. Saturday and Sunday are open to whatever I feel like making that day or whatever I have thawed out. Today I didn’t feel like cooking so I made some super simple keto pancakes. My family doesn’t eat keto so I made them some tuna helper – yuck! Dessert: Lately I have been eating sugar-free jello with about 3 -4 tbsp whipped cream for dessert. 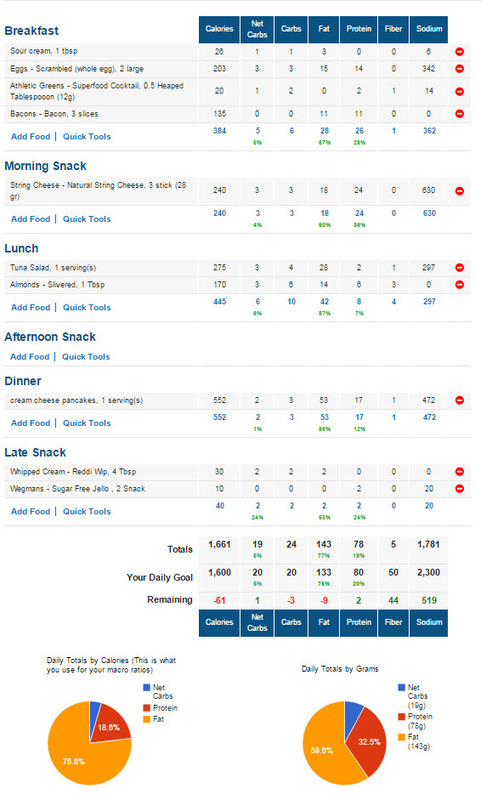 I am surprised my macros were almost right on target! What is also pretty crazy is that my calories are still within my 1600 range – and I ate bacon for breakfast! Before keto I would have felt like I was starving on 1600 calories. Eating meat and fat keeps me full all day long – I actually feel like I am eating too much! This doesn’t even feel like a diet! KETO ROCKS!